1. Your pet's skin is quite different from human skin. It's thinner, has no sweat glands, and has a different PH. Therefore most human shampoos are not satisfactory. Neither are many over-the-counter pet shampoo products, especially if your pet has any type of skin abnormality or disease. 2. 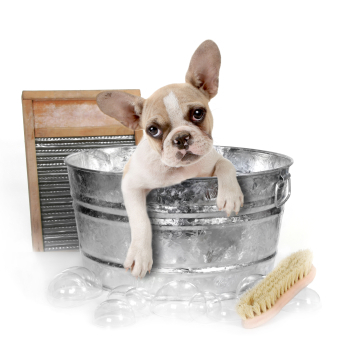 Bathe the pet whenever it is dirty or smells bad. To prevent excessively drying the hair coat we recommend youonly bathe the pet every 10-14 days BUT with our recommended products, it is safe to bathe more often whenever necessary. 3. BRUSH and COMB out mats BEFORE the bath. 4. Pack cotton in the ears. 6. Thoroughly lather. Add more water (instead of soap/ shampoo) to increase the lather. 7. Allow the soap lather to stand on the pet’s body for 3-5 minutes. (Medicated soaps: 5-10 minutes.) This step is very important!! 8. Use a sponge to wash the face. Using the fingers is better than any brush for lathering and scrubbing the skin! 9. RINSE THOROUGHLY to prevent skin irritation. 10. Repeat the soap procedure if the pet is extremely dirty. 11. Squeeze hair to remove excess water before applying dip solution. Depending on the enviroment and excerice the pet gets, they will with time file down their nails. If not, it is always good to bring them in to your vet to have their nails trimmed or you could buy your own nail clipper and do it at home. Don’t make the mistake of buying cheap toenail trimmers. The steel in the blades of cheap cutters is not strong enough to cut toenails smooth, but rather “crushes” the nails, which can be very harmful to the interior parts of the toenail. You may purchase a quality pair of nail trimmers through our clinic. Cutting the toenails too short will result in bleeding. Although it looks like a lot of blood, it really is not. It is impossible for a pet to “bleed to death” from a toenail trimmed too short. Commercial preparations are available to stop the bleeding. A simple home remedy is to push some maizeina or unsented powder onto the toenail or push the nail into a bar of soap. The powder or soap will pack up into the nail putting pressure to stop the bleeding. 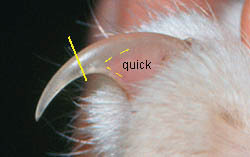 The “quick” grows out as the toenail grows longer. Keeping the toenails cut short allows normal walking pressure to keep the “quick” short. If the toenails are not kept trimmed, the “quick” will grow out so far that the toenails cannot be trimmed back properly without making them bleed. In cases where this has happened, we recommend a procedure where it involves sedating the pet to prevent pain so the toenails can be cut back to proper length. 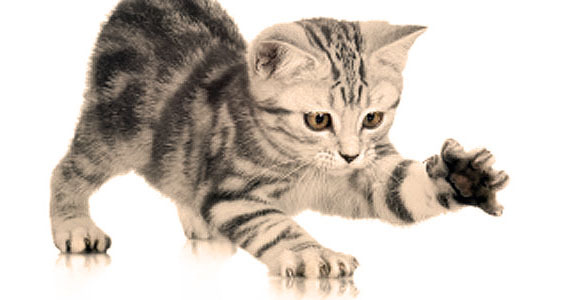 This can be done by booking an appointment with one of our friendly vets to assit you. Please note that this will be a time consuming prosedure therfor please make provitions to bring in the pet in the mornings on weekdays. If you have any questions, please send us an email or contact us on 012 809 0186. For more practice details go to our Contact us page.